I am an about-to-be unemployed high-tech writer who has been quilting 15 years. I have loads of experience with many quilting techniques that I have learned over the years. I enjoy wallhangings and quicker projects. I have made involved projects and not made enough to cover my time. That just left me frustrated. 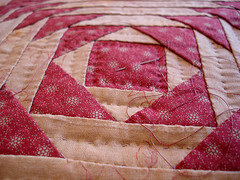 I very much want to build up a quilt business both quilting and teaching quilting. I have a draft website — I mean info about my products have been on a page on a friend's Website. She gets a cut if I get a sale. No one has bought anything over the last year. I don't know how many hits she gets on her site, but she is not doing much Internet marketing and I thought I need to take it back from her to get more exposure. I haven't a clue how to make that happen. I live in Israel. The economy in a good time is not booming for products that are “luxeries”. Now that the economy is sluggish, my husband thinks I will have a lot of trouble reaching local people and getting their interest. But it doesn't only have to be a local business, since the Internet can help bring people to me. I just don't know where to begin. I admit I have only read part of your book so far. Maybe you touch on all these issues… Maybe you could respond to some of my concerns so I will still have the gumption to pursue this dream of mine. So, maybe I haven't said anything new that you ahven't already addressed. I hope that is the case. Sorry to hear you had a bad day last Friday, and to me, it sounds like that type of exhibition event would be very confusing for not only the artists, but also the customers. Of course, it could be much simpler than it sounds. It seems like you're looking to start selling your quilts on a more full-time basis (or expanding your part-time work). With a website, you should most definitely have your own website, not as an add-on to someone else's website. I would take your information and put it on a site of your own, with your own domain name (URL) based on the name of your business. This is the first path to getting more traffic to your quilts. Next, there are ways that you can get listed for your local area, such as directories and local business listing websites. I'm not familiar with what Google does in Israel, but in the States, they also have something called Google Local Business Center. With this service, Google lists local businesses with maps and addresses, as well as any pictures, videos, etc. you want to associate with your site. You can also get customers to review your business, which helps your listing get higher in the rankings (assuming the reviews are good). Teaching quilting classes is a great way to supplement your quilting business income, and could become a major portion at some time in the future. 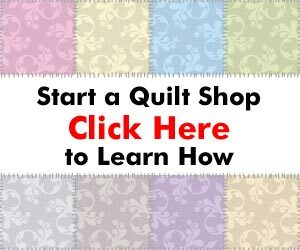 If there are any quilt stores or fabric stores in your area, you can see if you can place an advertisement, brochure, or flyer with them to let people know there are classes available. In addition, there are a number of adult education centers here in the States where people can get lessons about all kinds of subjects, including quilting and sewing. If there are classes like that in your area, they are not too hard to get into as an instructor (they are always looking for reliable instructors). This can help with your quilting lessons business – offer beginners courses through the center, and then offer more advanced courses on your own. A quilting business, like any business, requires attention to not only your core business of creating quilts and quilting classes, but also to the basics of any business like marketing, customer service, and accounting. Make sure you let people know about your business, and discuss it with anyone who seems to have even a slight interest. Referrals are a great way to get new business, and it may be that the person you talk with first may not have an interest, but they would love to tell a friend about your business and that friend may be interested. And remember… we all get a little down at times but we need to keep on moving in the direction of our dreams and goals. I don't always have the initiative to keep posting on the Quilting Business site, but I've finally decided to move ahead and bring this site to its full potential. Hopefully, a quilting business is right for you and you'll make the same decision. Hope you find this useful, and keep the questions coming! Please use the Contact page to send your questions. Hi Joann – I have a number of books on starting a running a quilting business, including “How to Start a Quilting Business,” “How to Start a Machine Quilting Business,” and “How to Start a Quilt Shop.” All of these books are available online only, so you won’t find them in any quilt store or on Amazon.com. There are certain requirements for having a book sold in a book store, and I haven’t really gone through the hoops to do this.